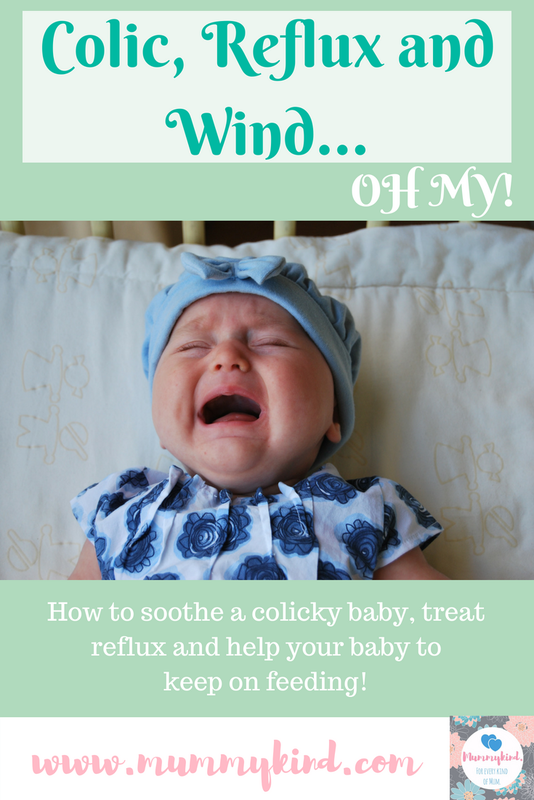 Colic, Reflux and Wind… Oh my! Ah colic, every parent’s worst nightmare. I still have flashbacks to this day. I was a super lucky parent with Oliver getting both reflux and colic – lush, huh? I remember at around 5pm every night we would all look at each other and give each other a mutual nod; that was the time his colic and reflux would start to pipe up, and we would almost start preparing in advance. Cooled boiled water, muslins and infacol at the ready. Right on cue at 5pm my baby boy would start getting upset, we all took turns trying to comfort him and help him. As a new parent I had no idea what colic was, I was out of my depth. All I knew was that my little pumpkin wasn’t happy and I didn’t know why. Fortunately at the time, we lived with Oliver’s grandparents (his dad’s mum and dad) who were amazing with colic. We called them the baby whisperers because all his grandad would have to do was place Oliver on his shoulder and he would settle, despite the many minutes I had spent bouncing, rocking and shhh-ing Oliver, meanwhile during this time Oliver’s Nonna would make me a cup of tea and we would prepare to tag in…and honestly I don’t know how we would have made it through the colic phase without their help. As time went on his colic got more severe, resulting in 111 sending an emergency ambulance at 4am one night because his screaming was so intense. From that moment on I was a woman on a mission. We started baby massage, cranial osteopathy and took him to the GP. Baby massage was perfect, I felt so close to Oliver at the class and it was fascinating to see him learning the cues for massage and it was something everyone could do at home with Oliver. Cranial osteopathy was an interesting one, I was intrigued as my mother in-law at the time said it helped for Oliver’s dad. At the first appointment, we talked about Oliver’s birth and the osteopath had a theory that his traumatic birth could have been a big contribution to his colic/reflux now. He taught us some things we could do at home to help with his colic spells, and one thing which seemed most effective was the “tiger in the tree” holding pose which was a godsend! We just simply laid Oliver across our arm face down and rubbed and patted his back which helped massively. we were advised to give him more cooled boiled water to help. Message your mummy-friends; chances are they’ve been there or are currently there, and even if they don’t read it until the morning you’ll feel better for getting it off your chest. Skin to Skin with your baby – Oliver took a lot of comfort from being on my chest and it really helped calm him. Infacol/colic granules – ABSOLUTE HEROS, the granules are what Sarah actually recommended to me when I was at breaking point one night. Cranial osteopathy/Baby massage – Even if you are unable to get to a baby massage class there are tutorials on the internet. Look at cry-sis who are an amazing support line for any parents who have a crying and sleepless baby, offering support and advice for any exhausted parent. But, lastly, parents around the world, know this when you’re awake at any unholy hour questioning everything in the world. Your baby loves you, you are doing all you can and…this will pass. Previous Post Review: Enchanted Garden PlayBag by the PlayBag Company! Next Post ENDED: Mummykind’s BIG Birthday GIVEAWAY!